So, I’ve got a problem with New York City. Yeah, it’s “the best city in the world.” I know. It’s the hub for the creation of great music and art. But, could you share it with the rest of us? Maybe? Venturing to New York City I check out the female-fronted indie/hipster/dance-y band Looker, whose members ventured towards each other and came to be two years ago. Three ladies stand on the stage looking hard and hands-off. No smiles. Not much conversation. The usual introductions. Sad and morose you think the show will be. And then it begins. The zippy start and quick thumps of “Tickle My Spine” a catchy and sing-along song that makes me want to move and bop like no one else was in the room. But, looking around all the “cool” New York cats are standing enthralled as I am, but they aren’t moving. So, here you see my first problem. I’m digging the music and showing it, but in New York City you can only silently dig it. You stand in converse and blazers, looking around to make sure they didn’t see that quick head bop. You wouldn’t want to uncharacteristically smile or jump. So, who are these girls…and guy that have me moving? 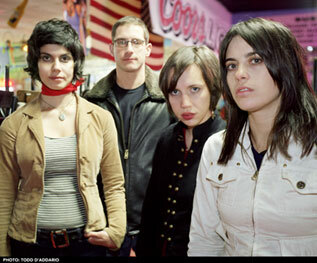 They are Boshra Alsaadi and Nicole Greco on vocals and guitar, Rich Smalley on drums and Rachel Smith on bass guitar. And while they have a sound that may not be completely definable, it’s still so snappy and wonderfully dark at the same time that it’s even a treat to stand next to Trendily Dismal New York City Man. Before the band began in 2003, when Alsaadi enticed Greco to move to NYC from Europe, the two had met at band camp when they were 15. They continued to see each other once at a year at the coveted Renaissance Fair (it’s a PA thing). Smith was picked up from Santa Cruz, CA and Smalley was recruited from producers he worked with as a session drummer. As fast as the bass lines in their songs, Smith learned the bass in a month, while both Smith and Smalley had to learn the songs for their first gig in a week’s time. From then on Looker became something to see. AX: How does the band go about writing songs? Looker: Boshra and Nicole basically trudge through life and are inspired by what’s going on around them. Be it a current event, a current break up or a new love, they ride around on their bikes and come up with new ideas on a daily basis. The great thing about a writing partnership is that if one is coming up dry, the other one is usually full of ideas. Our best songs are always the ones that are a true collaboration between us, with Rachel and Rich rounding it out with their parts to create something unique. AX: How would you describe your sound? Looker: We push the contrast between really melodic songs and something darker. All four of us have completely different and distinct tastes in music. Although this was initially a cause of distress it has turned out to benefit our collective ‘sound’. Having three female vocalists definitely makes us different as does the combination of poppy radio sensibility and more rocking guitar noise. Rich’s technical and razor sharp drumming style also adds another element not necessarily found in the traditional ‘post-punk’ (as we’re usually categorized) bracket. People tell us we’re hard to define, which is something we hold dear. AX: What do you want the fans to take from your music? Looker: Mainly to have fun, dance and forget about the squalor of daily existence. There’s also lyrical depth to our songs that make them very interesting to sing along to. We just want to produce the kind of music that we would like to be hearing — songs that you want to listen to again and again because they grab on to something that seems familiar or just right somehow, but something that hasn’t been communicated in quite the same way before. AX: what do you consider the best parts of what you do? Looker: There are so many great aspects. Playing live is the obvious reward for all of us. The energy is unlike anything else that I think we’ve experienced in our proper day and night jobs. Writing is also extremely rewarding. Coming in with a basic melody and leaving with a full blown song is a great feeling. Also, seeing faces [we] don’t recognize at our shows singing our songs word for word. AX: What are the most challenging? AX: What do you have planned for January and February? Looker: We plan to do a Northeast College run in February. We just finished a 4-song recording in the studio with legendary producer Richard Gottehrer (Blondie, The Go-Go’s, The Raveonettes) and recording engineer Joe Blaney (The Clash, Keith Richards). Hopefully those recordings will open some doors for us. I (Smalley) personally am in the process of starting the Looker Street Team to help with the promotion of the band. AX: What do you feel sets you apart from other area bands?